What do you get when you combine a great taste and an awesome name into a fruit that hasn't even been around for 40 years? You get the Dekopon. 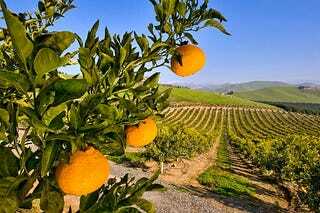 And according to the L.A. Times' David Karp, it's the best tasting citrus fruit he's ever had (he claims to have tried over 1000 citrus varieties). According to Karp, the Dekopon, which was conjured up in Japan in 1972, combines a mandarin-tinged sweetness with a tart acidity. It gained popularlity in Japan during the '90s, where a single Dekopon would sell for as much as $10. However, due to concerns over fungi and plant disease, the Dekopon (and its variants found in South Korea, Brazil and China) were banned in the U.S. Until recently, that is. In 1998, Brad Stark, a Southern California citrus grower imported a budwood branch (from which Dekopon fruit is grown). He grew it in quarantine for many years, using special methods to cleanse it of disease. Karp spent the following years trying to track down Dekopon growers in California (Stark's farm went bankrupt), only to be given the runaround by those in the know. As it turns out, growers were trying their best to keep the fruit a secret as they raced against one another to build up their orchards to produce significant crops.